My Journey to Fit: FMM - Renegade Stitchfix, and Knitting! FMM - Renegade Stitchfix, and Knitting! Have you guys have heard of Stitchfix - you know, that service that has a stylist choose clothing for you, send it to you, and you decide what to keep/pay for and what to return? 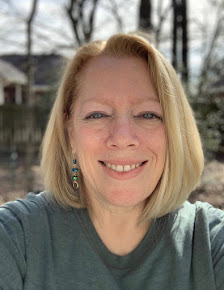 Well, in the Renegade Run Club, Karen is our version of a Stitchfix stylist. How it goes is she shows up on a Saturday run either wearing something new for running (could be anything from a new top to capris to a cute hat) and someone will be interested in it; she says where she found it and odds are, the following week one of us is wearing the same thing. Or, after a run, she'll change and come out in something cute, and next thing you know, we're all wearing it. Occasionally it will be someone else from our group who becomes the stylist, and very rarely it's me (my "novelty joggers" from Target a couple of years ago were a big hit), but in the end what is nice is that one person finds the cute clothing for the rest of us, and we don't actually have to pay a stylist fee like you do with Stitchfix or other similar companies! Recently, Karen changed into a cute pair of soft joggers after a run that caught everyone's eye - they were a dark green heather and super attractive. Information was exchanged, and Cary ended up ordering several pairs in different colors. I meant to check them out as well, but hadn't made it to the store before her order arrived. We were on a walk one morning when she mentioned that she misjudged her size because what she ordered didn't fit - they were too big. My ears perked up - ooh, maybe they would fit me! I took her joggers home, tried them on, and promptly wrote her a check for them. Boom - I got new clothes and didn't have to shop at all! And lest you think this is a one-time occurrence, I will say that clothing and shoes get passed around within our group quite often, which is really nice. Something will always fit one of us! Top is the first one I made, bottom is the second. They look the same, right? But wait! Here's the backs - see the difference in seaming? 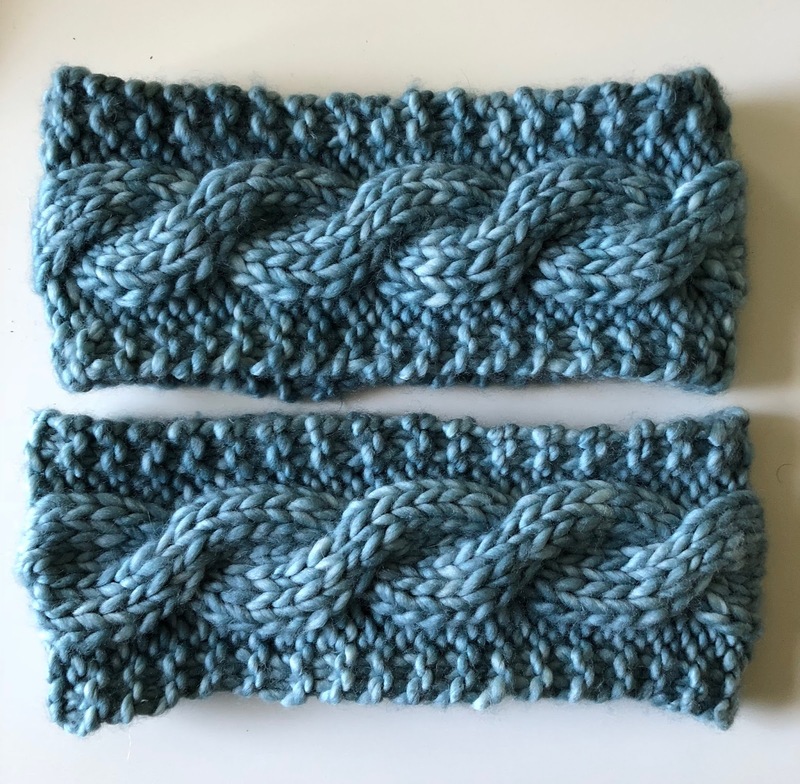 Top was done with a traditional cast on and bind off and then sewn together; bottom was done with the aforementioned provisional cast on and Kitchner seam. Much better, right? 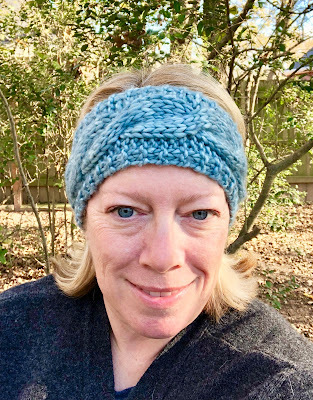 Pattern is Cable Knit Headband, yarn is Madelinetosh ASAP in Well Water colorway. Please excuse the too-close selfie - I had no photographer (aka Jeff) on hand to get the picture before I gave these away, so my short arms did the best that they could under the circumstances. Now, while the second way is better, the first way is still perfectly fine, and really, the seam won't be seen when you're wearing it. 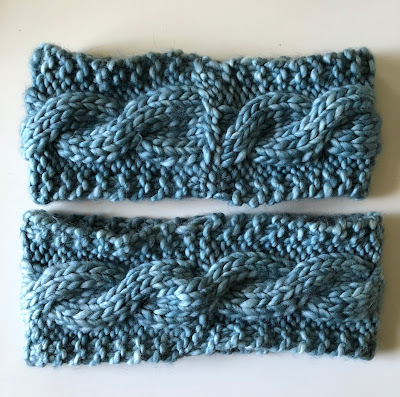 But this is the fun thing about knitting for me...I like trying something, and then realizing that I could take it one step further, which is what I did. It's almost Christmas, yay! We'll get to spend some good time together as a family, and we've even got the gingerbread houses already purchased and ready for our annual decorating throwdown - hopefully I'll have some time to get a post up with that craziness next week. Any case, have a great weekend and if you celebrate, a very Merry Christmas! Having your own stylist sounds like fun. I always enjoy seeing pictures of your latest knitting the ear warmers turned out lovely, and I like the 2nd one better too. Enjoy having your kids home for Christmas can't wait to see the pictures of the annual gingerbread houses. Merry Christmas to you and yours! You do have a variety of sizes in your group--I'm mostly thinking of heights! I would love it if somebody would do my clothes shopping for me. It just has no appeal lately. I love that you figured out how to improve a pattern. That really is a huge difference. I can’t wait to do the gingerbread houses this year! Which reminds me, I forgot to buy my roofing material today. Love the headband, you are so talented! I love shopping when you don't have to go to the store - sweet! Is all your snow gone? We are getting a lot right now :D Can you show a picture of what soft joggers are? Have a great Christmas! I’ll wearing a pair right now and love them! And our snow was gone by the end of the following day...oh well. I’ll send you a link for the joggers. I went to dinner at my friend Diane's and we were wearing the same jacket! We had both seen it at the gym. Those ear warmers are cute. Jacket twins, I love it! I've never read your blog before, but I do read Wendy's and your title caught my eye. The ear warmers that you knit are beautiful and I would buy a couple from you. What would you charge? My daughter rows and it gets cold on the Pacific. Hope you had a great Christmas!!! I was actually telling my boyfriend about your gingerbread throw down!!! Can’t wait to read about it!!! You guys should start a gingerbread decorating tradition! I love that Karen is your group stylist, and that the joggers worked out for you! When I started knitting I didn't realize there were so many cast on and off techniques! They make a HUGE difference, as show in your picture! Good for you for figuring that out and making the second one different! I swear, you could always be learning when it comes to knitting - but that's what makes it so interesting, right?